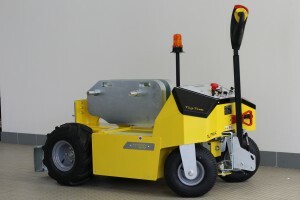 The TT-1000 is a battery-powered electric heavy weight Tug. The TT-1000 is the heavy weight Tug. 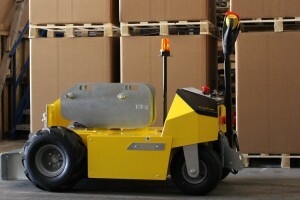 This pedestrian electric powered vehicle is designed to pull heavy loads. 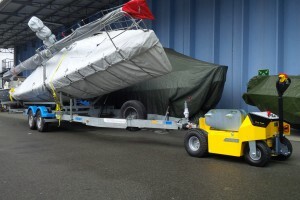 The 4 wheeled tug can pull up to 14.000 kgs and has a loading capacity of up to 1000 kgs. 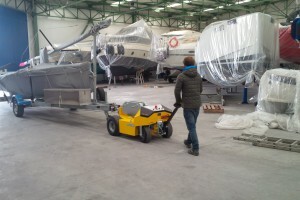 4 x 114 Ah maintenance free AGM batteries provide an autonomy of up to 5 hours of operation on a single charge. The TT-1000 is designed for industrial use and can be loaded with additional ballast to provide even greater traction. Often used to move private airplanes or helicopters the TT-1000 has an electromagnetic brake that blocks the movement when not in operation, preventing slippage while on an inclined ramp. Electro motor: 24V/3000 watt AC S2 60 min.